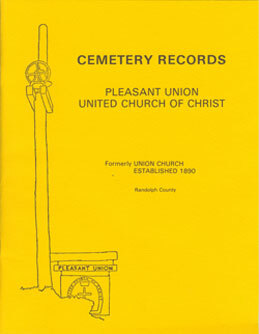 The cemetery at Pleasant Union United Church of Christ in Randolph County has been in existence since somewhere around 1850; it's hard to say exactly. Some of the people buried there had died as early as 1850. Many of the graves are old slate stones etched with abbreviated words and others are beautiful memorials. For years, the cemetery was refered to as "The McDowell Cemetery" because so many McDowells are buried there - including my great grandfather and many of his brothers, sisters, and expanded families. 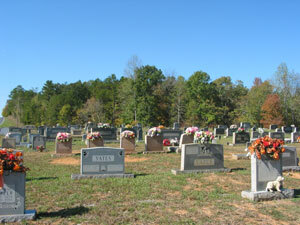 The cemetery is still active in that people are buried there today. Although Pleasant Union is small in membership, the graveyard is kept in beautiful condition and many markers have flowers mounted across the top of the markers...see the picture below.